What are your expectations for 6B? And what do tu WANT to happen? Did tu guys not see on his name tag where his first name start with an M? Okay, so before I start I'd just like to say that if tu like o amor Scott & Kira o dislike o hate them for other reasons than the ones I'm going to talk about here, then this articulo is obviously not referring to you, so please don't be offended. This articulo is not about tu not being able to dislike o hate a character, it's about HOW tu judge them. Before I watched this mostrar I was really critical because of the name "Teen Wolf" to me it sounded so much like "Twilight, TVD" and such things (Which REALLY isn't my taste). But I am SO damn happy that I gave it a chance because this mostrar proved me wrong pretty quick. Actually not long after I was already obsessed with the show! And I mean literally... When I first witnessed the mostrar I could watch up to Season 4 Episode 9. And after that I had to wait like everyone else. But I watched episodes none-stop, I know it's crazy but I only had breaks when I needed to eat o toilet. Now I have seen a lot of people like the twins and even más for the loss of Aiden (his death) and the loss of his brother Ethan (for leaving after his brother’s death) and I respect that. now I know this is very late, but it bugged me since the end of S3A when the lunar eclipse made all the hombres lobo turn human for 15 mints. now I don't have a problem with that it makes sense in some way I don't even mind that it happened to Scott & Isaac. 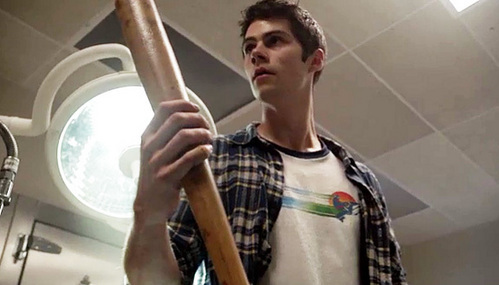 What is Stiles holding in his hand in this scene.